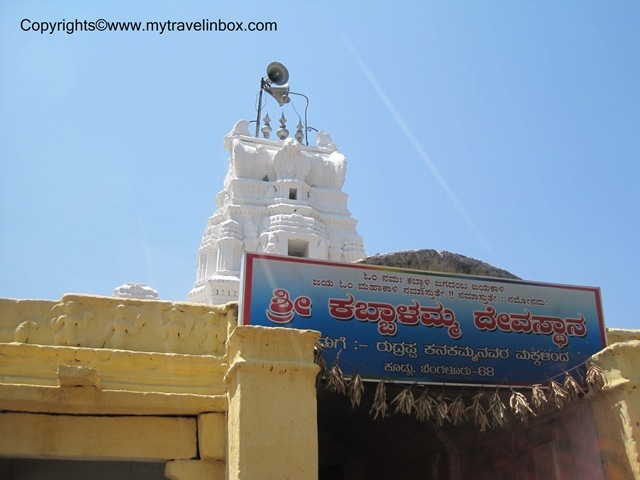 Sri Kabbalamma Temple is situated in a village called Kabbalu in Kanakapura Taluk, Ramanagara district, Karnataka. TV9 has broadcasted the story of this temple in its “Heegu Unte” program. Since then a lot of people outside the nearby villages came to know about this temple. It is said that several people got blessed by the goddess and became devotees of the mother. In the above picture along with the mother goddess we can also see the picture of a bull (Basaveshwara) decorated with flowers and clothing. 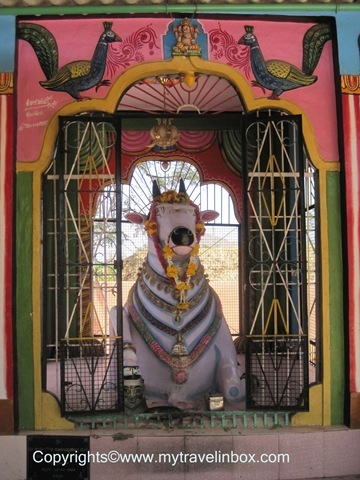 This bull is said to be staying in the temple premises for many years and has played a role of blessing the devotees. Devotees who pledged to offer something in the form of Harake to this bull need to sleep on the floor and the bull will slowly walk over them. This is a type of custom followed in this temple and it does not harm anybody. Even the small kids are laid down in front of this bull for his blessings (it is believed to be those children are born by the blessings of the goddess). 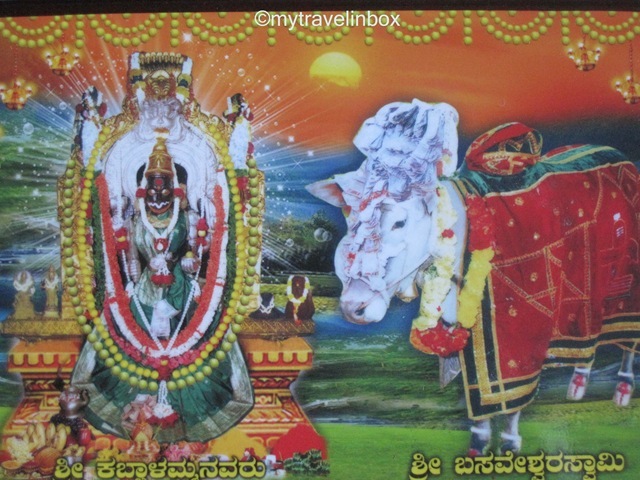 This temple can be reached from Bangalore via Kanakapura or Ramanagara / Channapattana. It is around 70 – 75 km away from Bangalore. Road to this temple passes through many villages and on the way we can see many rocky hills. Kabbalu Durga may be one of these rocky hills which is a trekking destination. 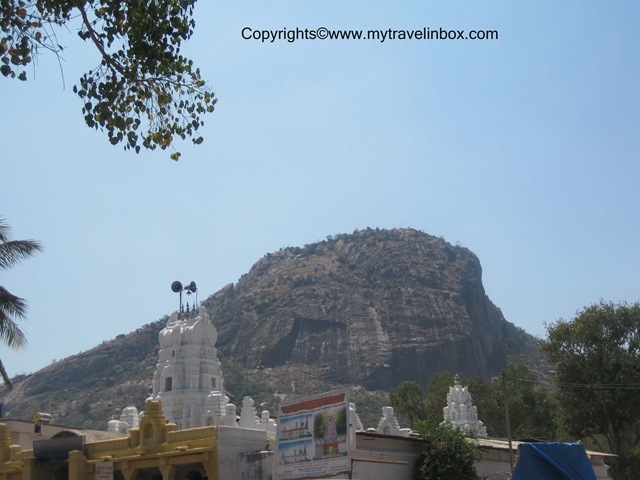 I guess the big hill with sturdy rocks which can be seen behind the temple in the above picture is the Kabbalu Durga but not sure. 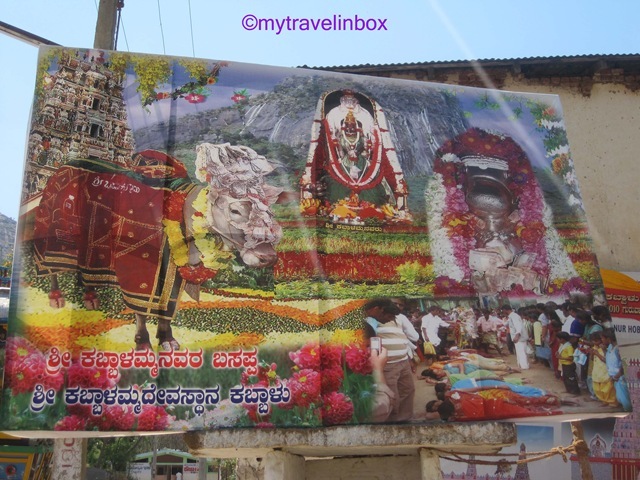 Near the Kabbalamma temple there is a small shrine dedicated to Basaveshwara (Bull – the vehicle of Lord Shiva). 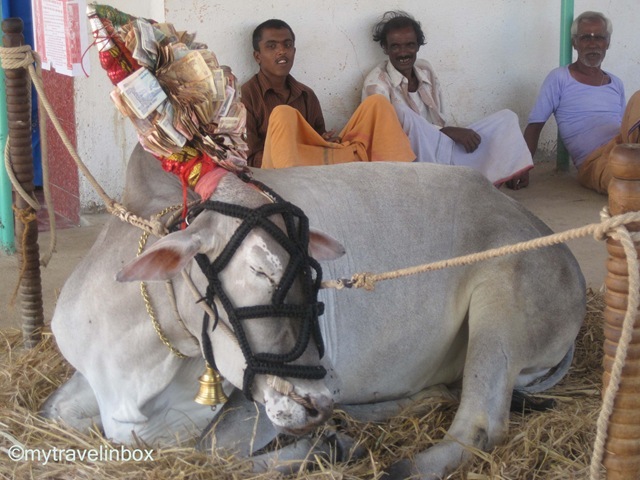 The miraculous Bull is carrying a bundle of currency notes on its horns. This money is offered to Basava as the devotees’ wishes got fulfilled. This temple is planning to build a new temple and also, the plan for the same is displayed in the temple premises. If anybody wish to donate the money for the brand new building can contact the temple authorities. 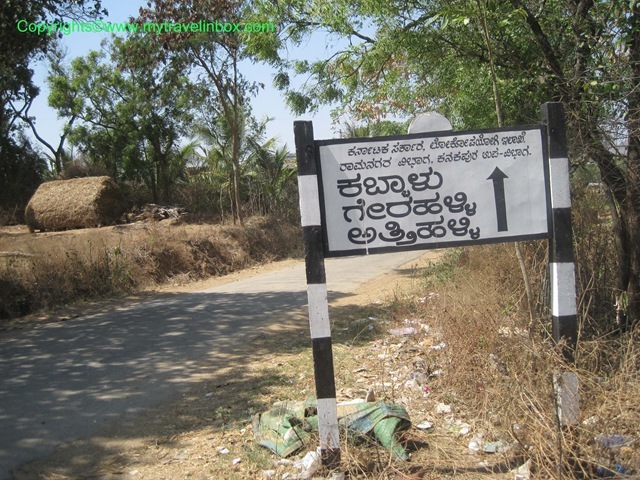 By own vehicle: Via Kanakapura: Distance 72 km. From Banashankari – Bangalore directly go to Kanakapura (52 km). From Kanakapura take the road which goes to Kollegal / Malavalli and near the board in the above picture (that is around 7 km from Kanakapura) take right, then reach Channapattana – Sathnur road and take left. Kaballamma is my favourite god. Thanks parawathi I Read your blog article it so nice. You know Tirupati Darshan Guide is one place where you can gather a bunch of information about Tirupati Balaji Temple of Andhra Pradesh. Its provides the best india vacation packages for you. From where you got this link. Its a very good website. I went through it. It provides loads of information about Indian temples. Thanks for the info. I belive the godess SHREE KABBALAMMA TAAYI the most. Mine many prblms were solved ay chanting of d taayi name. It is really a nice temple to visit and pray to goddess. Really this goddess will full fill your dreams. yes kabbalamma a powerful god. Really this goddess will fullfill all your dreams. Believe in kabbalamma n see the changes in ur life. Yes, I Echo all of your mails………..Kaballamma Devi is very powerful goddess. pls pray the godess in clear heart it will full fill your dream for 110%. I am going see kabbalamma I hope she will full fill my dreams!!!!! it is famous temple in karnataka .please visit the temple. may kabblamma bless all her devoties. i ve heard about dis in tv9 shortlu i ill go to dis temple…. any body wanna know the story behind kabbalamma? who she is? from where she came? I had been to this temple yesterday it is not so far from bangalore , if travel by own vichile it will hardy take 2 hrs from banashankari. Please visit this temple if your are free because we waste so much time for unwanted things lets spend small amount of time for our creator . Always do good things kabalama grace will always shower on u. Jai Kabalamma thai! Please tell me the complete story of the goddess kabbalamma in detail. kindly give us the information of kabbalamma & her story. my favourate god kabbalamma..bless my family..
Hey Kabalamma Tayi Very Power Full God. I Heartly belive the goddes Kabbalamma will bless me & our family throught out my grouth in our carrier. amma bless my sister with that proposal taayi.. we all beleived u only now. they also liked our family very much and we also liked that family very much. boy and girl both liked each other a lot.. now we are all waiting for your blessings amma.. amma do u remember us ma.. we all came to u when my father was there.. he always used to like u .. amma pl bless this proposal and shower ur blessings on us and make us true devotees of you taayi.. how we go to our home diety from now on we family will become true devotees of u and we will be coming to your temple now and then taayi.. kaapadu taayi… Jai Kabbalamma devi… pl bless us taayi and bless both the family for this marriage to happen . now everyone is waiting for your blessings taayi.. bless us.. Jai Kabbalamma devi..
Kabalamma temple is very good i went twice, last year when i went it was under renovation Goddess was covered with cloth, and we were able to see only Photo of Devi, i was very upset, i want to know renovation work complete? can we able see the devi……. remedy to all the problems is simple by dis goddess’s grace..
TAYI PLEASE SAVE MY SISTER FROM THIS DEADLY DECEASE I WILL DO WHATEVER YOU ORDER TO DO. PLEASE PLEASE SAVE US FROM THIS DECEASE TAYI. JAI KABBALAMMA TAYI PLEASE SHOWER YOUR BLESSINGS ON OUR SISTER TO GET RID OF THIS DEADLY DECEASE. nannolage sadaa usiradutiruva hesaru, avalillada, avala neneyada dinave illa, bari bhakti bittu berenu bayasada, maha shaktivante. kasta- kotale galinda nalugutiruvavaru kabbalamma na darshana maadi, kastagalu karagi hoguttave,idakke namma vamshave shakshi. I’m going to see Sri kabbalamma tayi… I hope she will full fill my all dreams. ..
Kabbalamma god is very powerful, please believe &go there max your problems are solved. amma plz bless me, am fully depressed about my job,plz do some miracle in my life ma. I stay in a different state of karnataka put heared about amma can anyone tell me can I take a printout of ammas photo and keep in my gods room so I can pray to her .